Could the Nose or ‘Proboscis’ of the Didinium Be a Boring Instrument, Which May Have at Its End the Grappling Ropes? Is the Didinium Mortally Wounded? Is Size Relevant to This Helper Interaction? Does Paramecium Have a Maternal Instinct? I just viewed this very interesting video, which appears to show two paramecia freeing a third paramecium from its Didinium predator. Image: “Didinium Ingesting Paramecium,”a photograph by Greg Antipa which was uploaded on July 15th, 2014. https://images.fineartamerica.com/images-medium-large-5/didinium-ingesting-paramecium-biophoto-associates.jpg ..
See how thin the connecting threads are, and how the proceed from the funnel-shaped proboscis of the Didinium and fan out in an umbrella pattern to attach to the paramecium? In the video below … at 6.53 – 7.03 … I note how the Didinium uses a counterclockwise rotational looping of the lasso 4 times round one end of the paramecium, and then a clockwise rotational looping of the lasso 4 times round the same end of the paramecium to capture it. Video: “Didinium eats paramecium,” by mantismundi, 3 December 2011, https://www.youtube.com/watch?v=rZ7wv2LhynM&index=2&list=PLwMH6wNUj41-hbwUtotYsGu39wdHMSKkD .. 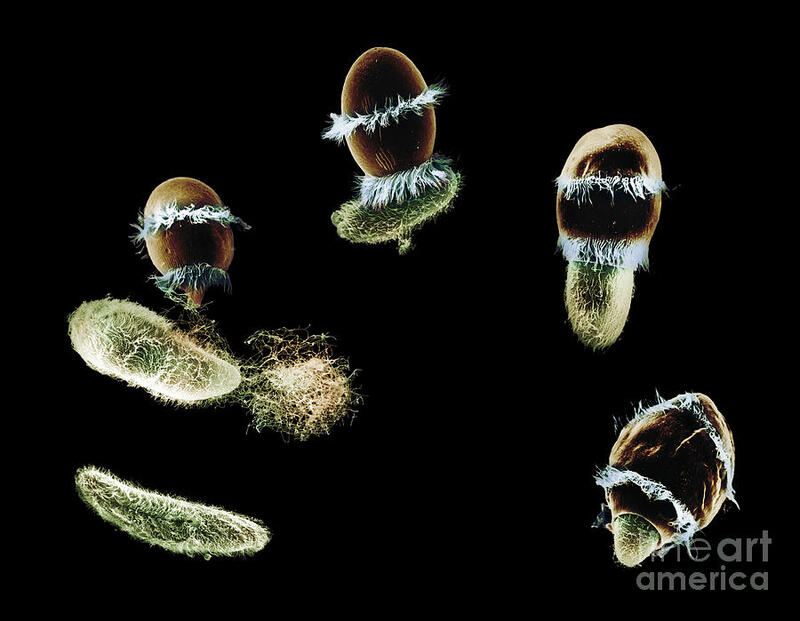 This looks like the image I saw in the above video … from 4.14 – 4.59 … There it looks like the Didinium is boring into the paramecium. Bored off fragments of the skin or ‘pellicle’ of the paramecium can be seen floating away. At 4.59 – 5.12 on the video, for instance, it looks as though the Didinium may have bored a hole into the paramecium’s pellicle, and that the paramecium then ceases moving. Is the Didinium’s proboscis, then, a boring instrument and funnel, and is it boring a hole in the pellicle and injecting a numbing agent into the side of the paramecium? The place on the Didinium where the connector threads or grappling hooks issue from its proboscis is relatively fragile and small in circumference. That makes it susceptible to being broken through, as may be seen below. In the video above … at 5.15 – 5.30 … two paramecia approach the third paramecium that has been lassoed by the Didinium. One of the paramecia then creates a rotational wave through its action at 8 o’clock to the captured paramecium. This makes the Didinium spin around, weakening the place where the proboscis attaches to the connecting threads or grappling hooks. Then the helper paramecium approaches from 1 o’clock, and through its movement creates a sharp wave front that snaps the connecting threads. The second helper paramecium nudges the freed captive away, apparently so that it will be out of danger. Is the Didinium Mortally Wounded? I note how the Didinium balls up and ceases moving. Is it startled and contracting because of danger? Or is it mortally wounded because the connector threads or grappling hooks have been broken off from its proboscis? Note that the freed paramecium is smaller than the two helper paramecia. Might this be relevant to their reaction? At 2.22 – 2.34 on the video, for instance, there is a Didinium ingesting a paramecium, and two other, larger paramecia approach and investigate. so this supports the notion that size matters, and that the small size of one paramecium may trigger a maternal or protective instinct in larger paramecia. However, in the action at 2.22 – 2.34 on the video, the larger paramecia give up and go away. Possibly though, it could be that once the process of ingestion starts, there is no way to free the captive. Positing That Didinium Expels a Numbing or Paralyzing Agent. As a normal paramecium might speed up to quickly avoid the Didinium, one might posit the Didinium may produce a numbing or paralyzing agent, that the second helper paramecium tries to counteract in nudging the ex-captive to safety. At 3.40 – 4.14 on the video, for instance, I note a Didinium has lassoed a paramecium, which is struggling but feebly. Is it just tired out, or has it been numbed or paralyzed? Then a larger paramecium swims up in a lively way; clearly it is not numbed or anesthetized. One wonders whether it had intention to help free the captive, but this is not possible to discover on the video, as the clip ends. This entry was posted in Interspecies communication, Protozoa, ZZ- Awakening with Planet Earth and tagged biology, commensals, Didinium, endosymbionts, helper instinct, Interspecies communication, maternal drive in paramecium, microbes, Microbiology, paramecium on 15 September 2017 by Alice B. Clagett.